A federal judge has ordered a mother and her daughter to be flown back to the United States, after learning they had been deported mid-appeal. The two were being represented in a lawsuit by the American Civil Liberties Union (ACLU), who said they had fled “extreme sexual and gang violence”. The judge said it was unacceptable they had been removed during their appeal. He reportedly also said Attorney General Jeff Sessions could be held in contempt of court for the deportation. Mr Sessions introduced tighter immigration rules in June and victims of domestic abuse and gang violence no longer generally qualify for US asylum. The government had pledged not to deport anyone in the case before Friday at the earliest, the ACLU said. 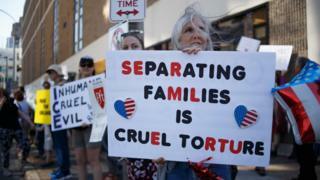 But the ACLU said they had learned during Thursday’s emergency hearing that the mother and daughter had already been put on a flight back to El Salvador by US authorities. Describing the situation as “outrageous”, he ordered the pair be returned immediately, according to reports. An official from the Department of Homeland Security told the Reuters agency that the agency had worked to comply with the court’s order. “Upon arrival in El Salvador, the plaintiffs did not disembark and are currently en route back to the United States,” the department said in an emailed statement. The mother and daughter are said to have arrived back in Texas, where they were being held, by Thursday night. According to the lawsuit, the migrant mother, known under the alias “Carmen”, came to the US with her young daughter after two decades of sexual abuse from her husband and death threats from a local gang in her native El Salvador. But their case was halted when officers found they did not have a “credible fear of persecution”. The case comes at a time when US migrant policy remains firmly under the spotlight after it emerged in June that migrant children were being separated from their families at the US border. Mr Trump signed an executive order seeking to end the policy, but more than 500 children remained apart from their families as of Thursday.